All Things Workplace: Do You Know Your Company's Unspoken Rules? Do You Know Your Company's Unspoken Rules? Every community of people has social norms . Norms are rules that are socially enforced that bring sanctions when violated. Families have them, cultures have them, and businesses have them. The sticky part of norms is that they are unspoken. You've got to figure them out. And therein lies the problem. When you violate a norm, you don't know it until you find yourself in front of "the enforcer." And if you aren't aware of this universal phenomenon, it's easy to find yourself in difficulty by behaving the way you always behave--the right way--using your own norms. Saabira Chaudhuri started me down this path with her Fast Company post. She's enjoying life in New York City and colorfully describes what makes it fascinating--from a sociological point of view. Which took me back to my first corporate gig working at the New York City headquarters of a pharmaceutical firm. Alongside my friend and then-recent Harvard grad, Dr. Bud Bilanich, The Common Sense Guy. Bud and I were raised in the suburbs; the kind of places where people smiled and said "hi"--even if it was in traffic court. So we were taken aback when, day after day, we would get on the elevator and ride up to the 19th floor--with no exchange of words and no eye contact. Every day. The same people, working for the same company, working for the same goals. No talking. No eye contact. We decided to do something about it. It would be good for relationships, good for company morale, and we would gain some visibility for initiating a large scale change. We might even be rewarded. Bud and I watched as one of the elevators began to fill with people. People whose lives were about to be changed for the better. When there was enough room for two more people, we stepped in and, with the door closing behind us, stood facing the rest of our target group. First, we introduced ourselves by name. No response. Icy stares. But we anticipated a little learning curve. Next, we extended our arms and initiated some hand-shaking. Unbelievable. No response. Icy stares. They weren't feeling the love. "Well, we're Bud and Steve from 19 but you know that. Let's get to know each other--no strangers here at _________, Inc."
Look, Bud and I weren't stupid. We knew about the whole timeline associated with major change. So we spent the first 10 minutes on 19 debriefing in our meeting room and planning how to move people along the great curve of life the following morning. Just as we finished our design, our boss came in to tell us that his boss--the Big Mamoo--wanted to see us. a. One of the norms was that, when someone broke a norm, their senior manager found out about it from someone. Actually, everyone. b. Our VP didn't have the same feeling for relational change that we had. c. He didn't even have the same need as we did to continue our employment there. d. He did, however, exercise a great deal of verbal creativity in his speech. (We didn't mention to him that he was breaking adjectival norms that would have been very upsetting to our parents). e. If you upset your VP, the rest of the department conducts leadership programs in Europe and the Caribbean. You conduct supervisory training in North Dakota. In winter. What Can You Learn from Our Exile? There's a really worthwhile discussion that you can have with your work group. Spend an hour around a flipchart and answer this question: "What are all of the unwritten rules that really drive how we do business?" decide to overtly reinforce the ones that move you forward. What are some of the norms in your company? What can you gain by having the conversation? Let me recommend Deal and Kennedy's book, Corporate Cultures: the Rites and Rituals of Corporate Life, which is not back in print. This book gave me my favorite definition of culture: "The way we do things around here." Now, my elevator story. In my corporate period I worked in a place like you describe. One day I had to stop by the office to pick up something and I had my son with me. He was carrying size. We got on the elevator. Stony faces greeted us. "Hi!" yelled Dave, who had just learned to greet people. No response. "Hi!!" he yelled, louder this time. Small smiles appeared but were quickly covered. Dave took a deep breath. "HI!!!!!!!!!!" A senior VP started to laugh and reached out his hand toward Dave. "Hi yourself," he said. Now everyone had permission to smile. Then the VP looked at me. I thought I was cooked. "When he grows up, I want him for sales," said Mr. Powerful. Dave, by the way, is now a corporate support tech with the unique ability to talk to powerful executives about dumb things they've done and leave them smiling. 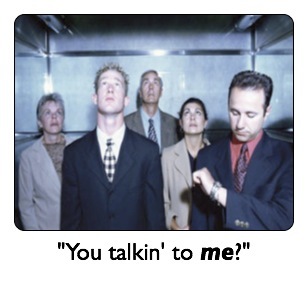 So the unspoken rule was: We'll act normal if the senior ranking elevator rider acts normal?!" Now I'm thinking that maybe it would be fun to put out a call for "Breaking the Unbroken Rule" stories. I like that idea. The thing about unspoken rules is that they meet the definition for a taboo: "a strong social prohibition (or ban) against words, objects, actions, discussions, or people that are considered undesirable or offensive by a group, culture, or society." That means that breaking the taboo is likely to result in punishment of some kind. In my early career, I worked for a company where one of the senior executives walked the halls in his socks. In meetings, he'd put his stocking feet up on a desk. Yet I got scolded for breaking the dress code when I wore jeans to work. The injustice of it all. I was in my 20's and saw a big inequity here. Of course now I know that there's an unwritten rule in many companies (unfortunately). Senior leaders are often excused for their bizzare or odd behavior(they're often called eccentric). I've consulted with many companies who acknowledge this unofficial rule...and just say "we deal with it." In my case, my "revenge" was to break the rules (in a way that caused no real harm of course) by wearing my jeans on days when I knew execs were traveling (and playing rock music softly at my desk...another thing I don't think we were supposed to do). I know I took this topic to another place, but it's such a rich topic...and fascinating how unspoken rules are interpreted, broken and perceived by people in organizations. Covert jeans and (quiet) rock music...isn't it fascinating what we'll do to put our little stake in the ground to just be ourselves. Which is, I guess, the real issue about norms. How much will we coopt our natural selves to be part of something else? And when it reaches a sticking point, what will we do to try and shift the equilibrium or rebel in some way that allows us to stay a part of the "system" while getting the satisfaction of having bucked it a little? Thanks for the addition...as these add up I'm going to do another post.